I love the Pure Synergy powders for my morning smoothies. This one has a sweet taste to it and is SO good for helping with cleansing the liver. 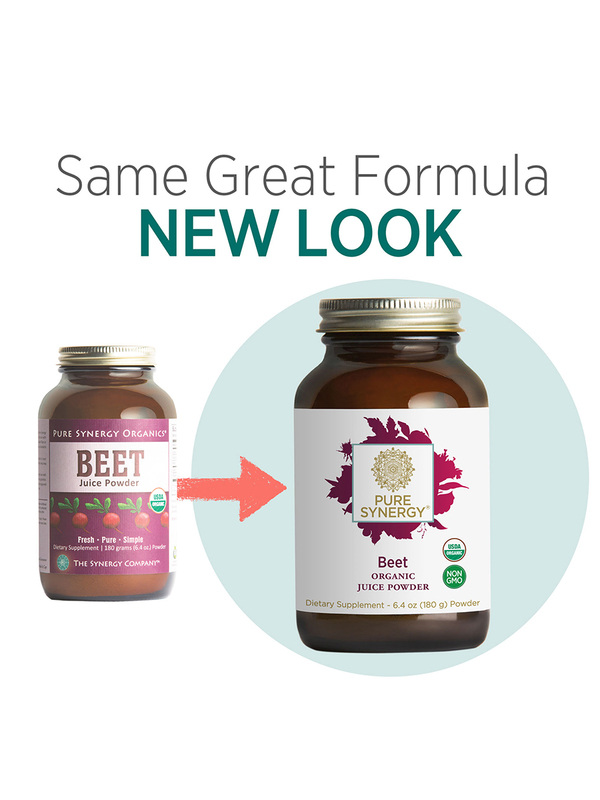 Overflowing with potent phytonutrients‚ health-restoring red beet juice with its rich magenta color and sweet‚ delicious flavor is reclaiming its rightful place as a wellness powerhouse. 1) “Pure Juice” = highly concentrated source of phytonutrients with optimal absorption. 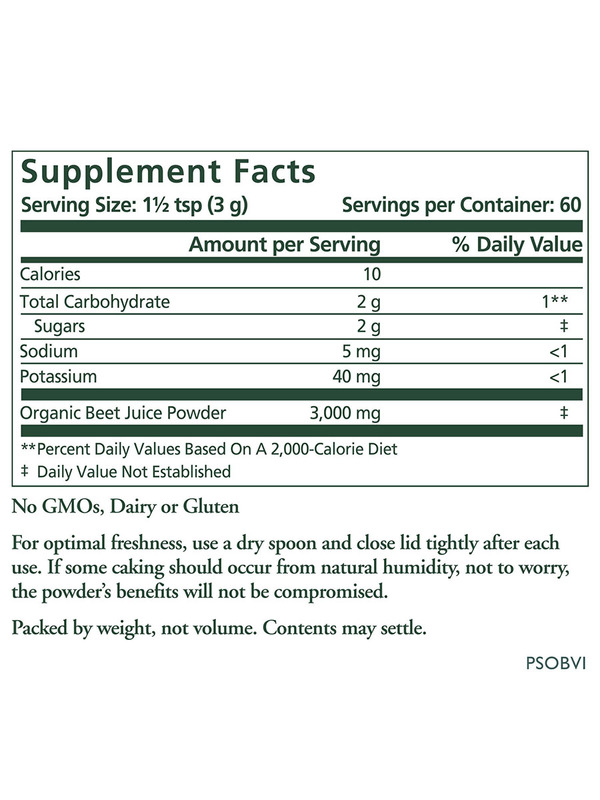 15 pounds of our special beets is used to make 1 pound of our Pure Synergy Organics Beet Juice Powder. 2) In contrast to other beet juice powders in the market‚ absolutely no fillers‚ sweeteners‚ carriers or other unwanted additives. 3) Our beets are a very special old world heirloom variety grown for their uniquely delicious taste and exceptional phytonutrient profile. 4) Peak harvest and cold-pressed juicing for optimal nutrition and bioactivity. 5) Patented low temperature vacuum-dried through an exclusive Synergy process to retain their wholesome goodness and freshness. 1) Rich source of antioxidants and phytonutrients for glowing health and wellness. 2) Supports healthy liver function. 3) Supports a healthy heart and circulatory system. 4) Recent study shows may boost stamina and exercise endurance. 5) Traditionally used as a blood-building and cleansing tonic. 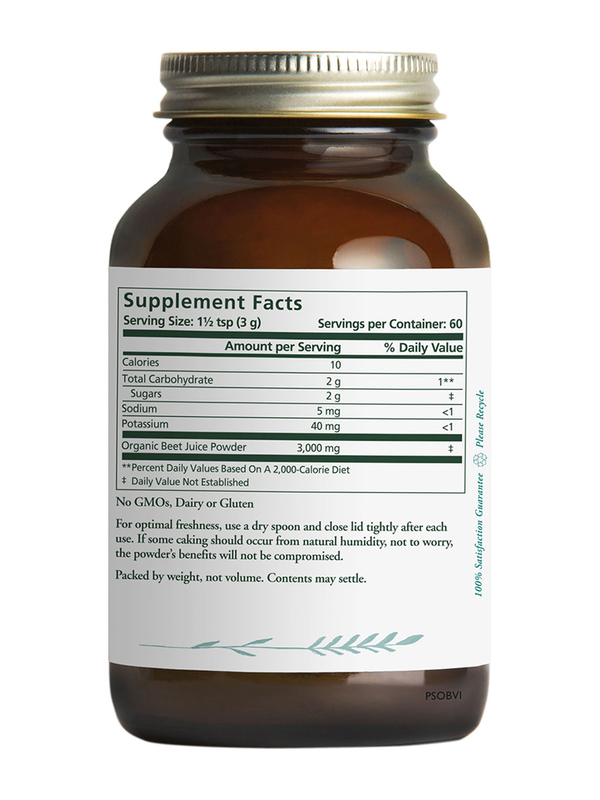 6) Supports healthy Phase 2 detoxification and glutathione activity. The red-violet pigments in beets are not only beautiful‚ they are actually a unique and highly valuable form of antioxidant called betacyanins‚ widely studied for their ability to promote optimal health by supporting healthy detoxification and managing inflammation responses. Beets also contain a 100% natural form of betaine‚ a key body nutrient‚ along with potassium‚ vitamin C‚ iron and other vitamins and minerals. A recent study in the Journal of Applied Physiology showed that beet juice consumption increased stamina and exercise tolerance. So next time you go to jump on that treadmill‚ or go for a hike‚ bike ride or walk‚ consider a beet juice pick-me-up to get you through your workout or activity. Already a seasoned athlete? Beet juice may just kick up your training and performance a notch! ** Percent Daily Values based on a2000 calorie diet. 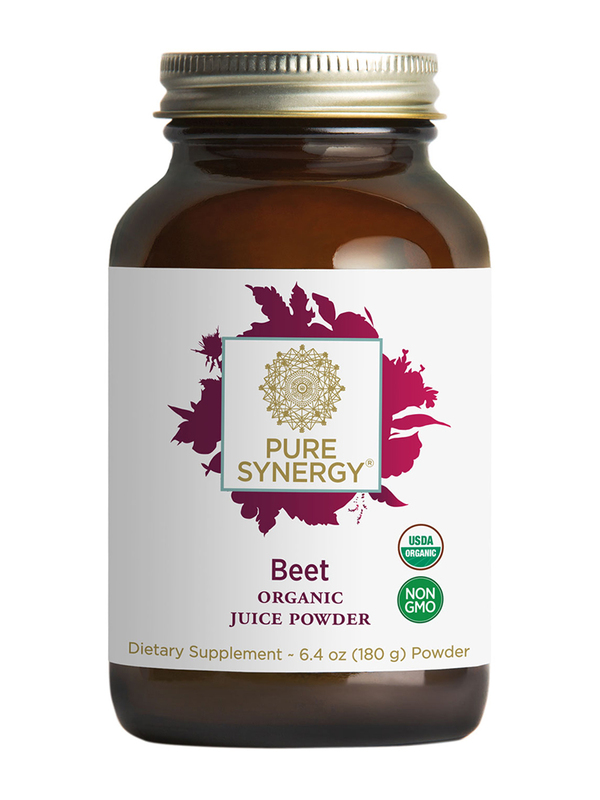 Pure Synergy® Organics Beet Juice Powder is a 100% naturally occuring source of healthful phytonutrients including betaine‚ betacyanins‚ betanin and phenols. One and a half teaspoons. More or less may be used depending on your taste buds and personal preferences.